On Thursday, the Jewish Week announced "Matisyahu's New Spiritual Groove," baring one of the first concrete interviews on the topic of Matisyahu’s affiliation with Chabad. The article makes the following clear: Matisyahu's continued exploration of Judaism has led him to connect with a sect of Breslav Chassidism, he isn't inspired by Chabad teachings like he once was, and his spiritual shift has been in the making for four years. To many Lubavitchers, the news hurts. When anyone who is connected to the Rebbe and his teachings suddenly turns his ties elsewhere, it is hard not to take personally. Moreover, Matisyahu is a public figure, who many of us feel experienced success largely by his connection to Chabad. It is wholly warranted to feel like Matisyahu’s recent comments are biting the hand that fed him. To me, there was nothing like seeing a Chabad Chassid dance in front of a crowd of thousands while singing about the Rebbe and wearing an “Ad Mosai?” yarmulke. When he said “Chabad philosophy/That’s the deepest wellspring,” I believed him, and was overjoyed that he was telling the world. To know that I no longer share this passion with an artist I admired and propagated is deeply disappointing. I feel like addressing the issue is almost unjustifiable. Firstly, because a reaction to a newspaper interview can never be strong basis for a discussion on someones real-life circumstance. Furthermore, on the most basic level, Matisyahu is not only my fellow Jew, but my neighbor. At the same time, though, someone needs to balance and focus the slander and immaturity that is bound to follow the Jewish Week's article. I hear a lot of people expressing that they “saw this coming.” This is totally beyond me. You’d have to be a prophet to predict that Matisyahu would grow an interest in Karliners, a rare sect of Chassidim that scream during prayer. However, more accurately, people DID expect that the so-called pressures of fame would force Matisyahu to forgo his passion for Yiddishkeit and come down from a “high” (one that note, there is absolutely nothing to be proud of in having anticipated that Matisyahu’s passion for Chabad fall lifeless). It is imperative, then, to recognize that Matisyahu’s is still a “Hassidic Reggae artist.” His new interest is a continuation – and in no way and end - of a spiritual journey. Matisyahu speaks of feeling more connected with his new teachers and style of learning. It is his desire to connect to G-d that has affected his transition, not the opposite. While many people (myself included) feel that Chabad Chassidus is, yes, “the deepest wellspring,” Matisyahu’s continued evaluation of his spiritual needs (particularly in front of the whole world) is praiseworthy. 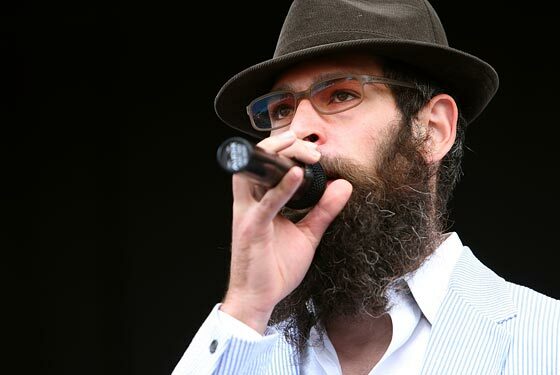 People should recognize that, while we may have gained – both personally and globally –from Matisyahu’s connection to Chabad, that doesn’t rob him of his entitlement to honest spiritual exploration. Yes, I am bothered that he told the world “Chabad philosophy is the deepest wellspring” but longer singing those lyrics. On the other hand, I never owned Matisyahu’s spiritual standing (though many people felt they did). I certainly wish Matisyahu would have more tact when it come to vocalizing his new views. But the statement made by Matisyahu’s “break off” is not as telling as our reaction is going to be. The way we acknowledge his new standing will speak louder and be the tell-tale sign of our community’s character. College students are asking campus Shluchim. Will we be the elitist community who grimaces at a former “member,” or will we be the ones who, in sync with the philosophy we advocate, cares for the soul of the matter? Will we be the Chabad that inspired a revolutionary artist? Or will we be the Chabad that ostracized him? Hopefully this is an opportunity for Chabad's true colors to show some light. Our personal hurt should only be a symbol of our pride in Chabad, and never a catalyst for bashing and further ostracizing another Jew – regardless of how often his music plays on MTV. In the Jewish Week interview, Matisyahu points to the fact that, when he was first becoming religious, he would pray alone on the roof of his college and scream his prayers to G-d. For him, this was a mode of connecting. And now, he has discovered a sect of Judaism that does just that - approaching prayer in a way that Matisyahu himself discovered on his own. While Chabad only saw Matisyahu as a Lubavitcher, people should realize that a persons spiritual journey (especially when it involves returning to Judaism) are multi-faceted, complex, and personal. I look forward to Matisyahu’s next album. Not because his sharp Chabad vibe strengthens me – for it no longer does – but because he is an honest searcher with a sincere interest in serving G-d in truth. It won’t be similar to the inspiration I glean from a Shliach, but like the joy I find in any Jew sharing a positive message, any Jewish warrior fighting for his soul. While I can’t necessarily relate to (or even believe in) a "universal message" or soul-search excluding Chabad, I am still convinced that Matisyahu’s musical journeys will always have a spark of something we hold in common. Great post Mimi. Thanks for writing a response. I needed to hear every word of that. I am hurt as well, but i am very proud of his commitment to find "his path" in Judaism. tx for writing this up..
religious search..... i cant even say christianity is next because he is there already. (POD Testify). How anyone affiliated with any jewish organization , let alone a n orthodox or chassidic organziation wanted to even mention his name after he sang for a group of missionaries (they sing about g-d and moshach! whats wrong?) i can't understand. Why are you waiting for his next album? thanks. this helped resolve some conflicted feelings i had. i find comfort in knowing that there are people out there who don't believe in rejecting others just because they aren't following the cookie cutter mold. Mimi, you have such a wonderful neshomo and you are so talented, but please realize that you were taken in by a scam artist. That is what showbiz is all about - with the exception of Avraham Fried, Lipa Schmeltzer (who is sincere in that he is so blatantly commercial) and MBD in his better days, even the "haimishe" performers are putting on acts for a living and could just as soon be selling used cars. "Matisyahu" (not even his real shem beYisroel BTW) was truly my neighbor during my 2 year sentence in Crown Heights. Not my home neighbor, but he lived around the corner from my shul, which he sometimes defiled, yes, the word is defiled, with his presence. Never mind his fake act of davening bearichus (if I had spent years on drugs that left me with brain damage that rendered me unable to learn how to read loshon hakoidesh and barely able to read English, it would also take me 25 minutes to daven Maariv), but his behavior was downright rude, especially on one particular occasion when I was in the front row seat for his display of rudeness toward (and behind the back of) the rav of our shul, a true Chossid who only was giving him brochos for success. He was never a chossid of Chabad or of the Rebbe. He represents the worst form of abuse of the ahavas Yisroel of the Chabad community worldwide. At least the crooked businessmen who hang around various Chabad shuls here in the FSU to make dirty deals, and are married to shiksas, do not even pretend to be Chassidim - they know they are just trying to buy a place a little further from the boiler room after whatever age kareis is. "Matisyahu" dressing as he does (at least on Shabbos - during the week he looks like any other alternative lifestyle freak in CH) is the same as me dressing up as a cross between Lipa Schmeltzer and one of the Ku Klux Karta nuts for Purim. ever sincere to begin with. But, of course, if you enjoy the music, and you feel that he does not desecrate the words of Torah by bringing them into the gutter (which is my opinion but I know many other Chassidim feel differently), go ahead and enjoy it before he switches acts again, changes his name to Killa Milla, and starts singing gangsta *rap. All you write is o so true! Although it is upsetting that matisyahu is not connected to the chassidus that i hold so dear i cannot be upset when another yid is searching for his way to serve hashem. He is not slandering chabad and we should not slander him. We are all here to make our own bechira whatever it may be. Out goes on, in comes one? Matisyahu leaves and Gad Elbaz joins? Nice circle going on here. Or shall I say pathetic? I could not help but stumble upon your blog after googling "Matisyahu's New Groove". I really appreciate the sympathetic yet candid approach you chose to take while expressing your feelings about Matisyahu. I hope he continues on the long journey we all go through in seeking a deeper connection with our heavenly father. Never wanting to judge, G-d forbid, I do feel that Matisyahu sharing the details of his personal quest for spirituality through judaism with the public is malapropos. It would have been more befitting for him to keep his thoughts confidential instead of declaring status as plainly "not affiliated with chabad" or the like. People go through many personal and spiritual journeys, including Matisyahu. However being that he IS indeed "matisyahu" and he HAS in fact shared with us, and the rest of the world his personal status is just contributing to the conundrum that is lubavitch. He is not slandering chabad and we should not slander him. Yes, he is slandering Chabad - see his disgusting comments about "the machine" which is just trash that he or more likely his handlers read on some site like Failed Scotty or Mentalcase (whatever it is called now). Wake up and smell whatever it is that Matisyahu smokes. He's as fake as the play money that Lipa uses as a prop when he sings the Gelt song on stage! And if he really did sing for missionaries, he should be treated the same way the six Nutter Karta fools who went to Iran are being treated - and that means cherem! By the way, this is not to say that Chabad should be a cookie cutter, cultlike group that insists on conformity for all. There has always been room for nonconformists in Chabad ("Dr Laz", Meir Rhodes and "Schwartzie" come to mind) - although they may not fit into the mold of "corporate Chabad" and therefore not be welcome in certain crowds or organizations, they are clearly Chassidim and respected as such except by the real conformist elitist snobs. The problem with Matisyahu (and others like him who are just not as famous) is insincerity and trying to remake Chabad in their own image by lowering standards and turning Chabad into another alternative 60's style love everyone with no boundaries (which often means being merciful to the cruel and cruel to the merciful) lifestyle. If I were you, I'd keep my opinions to myself. You just sound ridiculous. Look, I'm not Matisyahu's PR person. I don't know what he's thinking, what he thought when he was into the "Chabad thing", but I don't think it's anyone's place to assume that he did it all just to make it big. The words that you have chosen to relay your opinion are hurtful and downright cruel. How dare you speak about another Jew this way, no matter what the circumstances are. Here's my suggestion for you: don't buy his next album. Simple as that. But please refrain from spreading your poison, it's just not pleasant to read. I am not spreading poison. It is this performer that has been spreading poison (in poisonous venues) for years now, using and abusing Chabad and the Rebbe to do so. It is those who continue to defend the indefensible and who continue to deny reality who sound ridiculous - and we who are sane and responsible Chassidim are already plagued with enough deluded people who make us look ridiculous by denying reality - vehamayvin yavin. No need to deny reality over some cheap performer who made it big by dragging Chassidus into places that are worse than bordellos. In a year his stage name will be nothing but an answer on some trivia game show. In five years, his real name might appear on the welfare rolls or on a police blotter somewhere. As for speaking out - this guy will do and has done more damage to Chabad than the NK freaks did to frum Jews in general. The difference is that no one takes the NK freaks seriously, and NO ONE embraces them the way some Lubavitchers embraced this performer. Far too many people, from shluchim who should have known better to kids who idolized him, took this performer seriously and saw him as a role model or at least a positive example for Chabad and especially for Chabad youths. And I am not the only one who has witnessed his rudeness. He has been rude to many who have been good to him. (I do not believe he is even in control of his actions at all times due to his admitted history of hard drug use. However, since my knowledge of drugs is BH not first hand and therefore very lacking, I really am not sure if these substances cause permanent brain damage. I am not about to bother asking my friends who do know - respected medical professors, not actual or even former druggies - as it really does not matter whether he's a shoiteh vegas ruach because of drugs, upbringing or failure to overcome his bad traits). As for the concert, enjoy the show if that's the kind of show you enjoy and if it is being held at a venue where you feel comfortable. That is what it is - a show - and that is what this performer's life is all about. Shows. Period. MAYBE TRY USEING KARLIN STOLIN SONGS. Karlin Stolin is a long way up for someone whose songs are just plain STOLEN!!!!! Forgive me, but I don't believe that there are copyrights to Lubavitch niggunim. Another thought (though I'll say l'havdil...) If someone converts to Judaism and later abandons the religious lifestyle, the conversion still stands as long as that person was sincere at the actual time of conversion. I personally believe that at the time Matis wrote his lyrics, especially those on his first album, he wrote them in earnest. It's impossible for me to believe that someone could have written such deep and intricate lyrics without understanding or believing them. Therefore, despite what may come, I and others will continue to be inspired by his previous works. CHANA YOU CAN COPYRIGHT A SONG .ALL I AM SAYING IS HE TOOK OUR HOLY SONGS SANG THEM TO SWAYING AUDIENCES OF HOLY BROTHERS ,HASSDIUM ,WHITES TRYING TO BE ETHNICK AND ASIANS .LET HIM GIVE SOME MONEY BACK TO CHABAD .NOT JUST PLAY BACKET BALL ,WITH SOME "KIDS AT RISK"
No matter what he does, we should remain above personal attacks. 1. Why are we shocked that this happened, he has spoken about his feeling boxed in by Chabad in the past . . . I never thought it would be Karlin, but this has been in the works for a while. 2. Though Matisyahu, as any human being, has the right to lead his life as he sees fit (despite any misgivings I may have as to what is the truth) why must he go public about his decisions? Distancing himself from Chabad is fine -but just remain quiet about it . . . He knows very well that making such bombastic statements will a. bother many Lubavitchers and b. draw increased media attention. It is due to this then, that I smell a rat. "If someone converts to Judaism and later abandons the religious lifestyle, the conversion still stands as long as that person was sincere at the actual time of conversion." der shygetz, if you dont have anything nice to say don't say it at all. mimi had a real nice, ahavas yisroel'dik post and you don't have to ruin it with lashon hara, whether it's true or not. You can start your own lashon hara blog if people really want to read it.